Are you looking for state government jobs? BELTRON Recruitment 2019 has announced its recruitment vacancies for the post of data entry operators at Bihar. 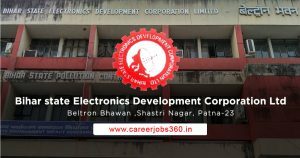 BELTRON (Bihar State Electronics Development Corporation LTD) has going to recruit the candidates who are all completed the HSC. The candidates who are all seeking the state government jobs in Bihar, it will be a great opportunity. As per the official notifications of the BELTRON, these vacancies are allotted for the posting of DEO. The BELRON DEO Various Recruitment 2019 has going to be held in Bihar. The interested candidates have to submit their application form in online. The last date for the submission of the online application form is April 26, 2019. The candidates have to qualify with the +2 or HSC. In addition, they must complete one year of computer course and typing knowledge in the English or Hindi language. The interested candidate candidates have to pay the application fee through the bank challan. The bank details are clearly mentioned in the given below information. The application fee for the eligible candidates is Rs. 1050/-. However, you have to pay the bank charge as extra Rs.50/-. The section process is completely based on CBT. If you want more details about BELTRON recruitment vacancy, syllabus, upcoming notifications, etc are clearly given the official website. The candidates must have completed +2 or HSC (Higher Secondary) from a recognized board. They must compete with a one-year computer course and having a typing knowledge in Hindi/English language. In addition, the candidates have to pay an extra Rs. 50 for bank charge. Mode of Payment: the interested candidates have to pay the application through bank challan in the IOB A/C no. 151201000011521. Step 1: If you are interested to apply for the post of data entry operator, you may visit the official website www.bsedc.bihar.gov.in in BELTRON Data Entry Operator Recruitment 2019. Step 2: you have to click on the “notice & circular” and find the advertisement for the post of data entry operator. Just click on the advertisement and read the notification. Have to check the eligibility criteria for applying this post. Step 3: Your educational qualification and age limit should be satisfied. Then only you can able to do further processes. Step 4: You have to download the application form and fill the information as per your original certificates. Step 5: Finally, you have to click on the submission button and print your application form.